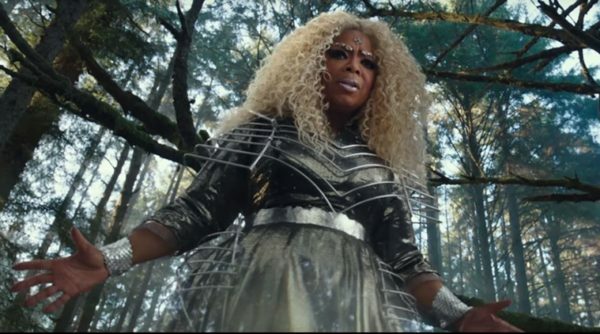 “Unfilmable” is the word often thrown around when discussing a film adaptation (keep in mind, a mini-television series from 2003 does exist) of Madeleine L’Engle’s children’s novel A Wrinkle in Time, and despite director Ava DuVernay’s strongest imaginative efforts and ambitious aspirations, like a character in the visual spectacle says, “in order to be great, you actually have to be great”. No passing grades here, although I do admire both Disney’s commitment to funding and releasing a live-action product this unorthodox, tonally bleak, and perplexing, complete with a diverse cast of racial backgrounds and interracial relationships that seamlessly blend into the story without unnecessary extra attention. The issue is that A Wrinkle in Time might just be as labeled: unfilmable. Technical CGI wizardry should always serve the story, but throughout this experience, the direction and photography seem to be fighting to find a purpose for each dash of perilous special-effects. Early on is a sequence involving the protagonistic elementary school-aged kids riding through the sky on an emerald-colored manta ray type beast with a few dragonlike facial aesthetics which unsurprisingly results in life or death degrees of danger, but all of it feels hollow and shockingly bland for how radiant the hues are, also furthering none of the complex story talking points (ranging from quantum physics, traveling through time to different dimensions, and lightness and darkness existing all over seemingly with the power to influence behavioral patterns of individuals depending on their tolerance levels for evil). By the time Michael Pena shows up in bright beachwear as an obvious villain with ulterior motives in a Stepford Wives/Get Out reminiscent parallel universe where everyone is presented as a deadpan robot not to be trusted, I genuinely started to undergo an inner mental struggle in regards to whether A Wrinkle in Time deserves applause for its unabashed peculiarity or to dismiss it as an unmitigated disaster of failed concepts in execution. The film works best when science is behind its visionary traits (there’s a smart bit involving topographical lines drawn and alternate planes of existence that is easily the most stimulating set-piece, and funnily enough it is also the least extravagant blockbuster portion and likely the cheapest part to animate), but an unforgiving amount is disengaging exposition and flat emotional climaxes without competent enough characterization to render the themes discussed earned. The script from Jennifer Lee and Jeff Stockwell spill out what the most prominent takeaways from the narrative should be (finding the ability to confront one’s own darkness and sources of unhappiness head-on in order to come out on the other side a lighter person, and that fathers should insert themselves more into the lives of their children rather than lock themselves away surrounded by work, especially work of the world-changing ultra-brainiac kind), but nothing in the movie up until the ending does anything to win over any substantial resonance. The father of the children (played by Chris Pine) is underdeveloped, the non-blood related siblings are not given enough material to work with to make us care about the dynamic of possible abandonment, and the less said about the trio of magical fairy figures appearing out of thin air to point the heroes in the right direction the better. Look, the costume design is average at best and does include some nice subtle touches (watch as Reese Witherspoon’s Mrs. Whatsit changes the color of her lipstick to more appropriately suit the colors of her current garments), but most of it is far too busy and overdone. Mindy Kaling’s Mrs. Who is the only one that comes away slightly unscathed. Meanwhile, Oprah Winfrey’s Mrs. Which is a hideous mess apparently dressed as a knight with silver metallic eyebrows and so many more jarring oddities. To be fair, she’s also the only one enlarged to gigantic proportions which also makes her stand out, but I’m not convinced that she would look any less ridiculous otherwise. Likewise, her performance is boring and monotone, which is actually the defining trait of Mrs. Who but works much better thanks to her gimmick of only being able to speak by blandly reciting notable quotes of dialogue from various celebrities and historical icons. Also unforgiving is the fact that they add nothing to the plot other than extended exposition that fails at explaining the astrophysics in an intriguing way; they exist solely to add another whimsical layer to the proceedings and steer the heroes in the right direction, disappearing halfway through the movie and reappearing to verbally pat them on the back after a successful journey. Aside from how off-the-wall A Wrinkle in Time is, the acting chops from the children are to be appreciated. 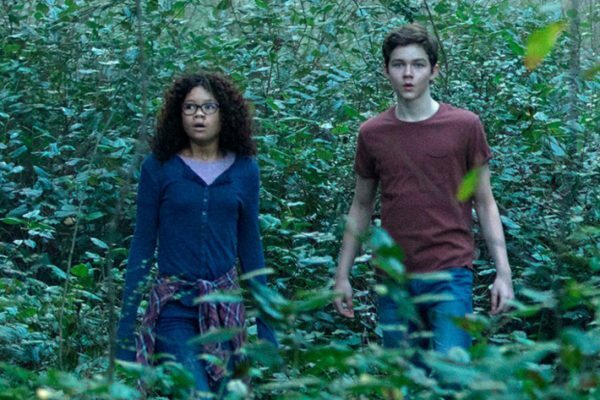 Storm Reid is working overtime in hopes to connect the audience into her struggles, but her efforts are probably in vain as the experience is too complicated and confusing for kids to understand but not adult oriented enough for teenagers to take a liking to. If you must, only come for the visuals and to support diversity in filmmaking, although honestly, even the CGI is occasionally ghastly, especially during brightly colored woodland landscapes that only draw attention to the fakeness of it all. 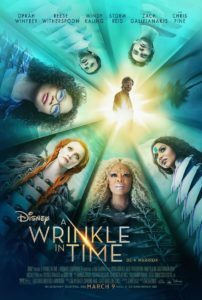 A Wrinkle in Time is absolutely the least “Disney” of their live-action movies to be released in quite some time, and factoring in that it is a misfire, hopefully, this will not discourage them to take more artistic risks in the future. If nothing else, Ava DuVernay did a decent job for “unfilmable”.